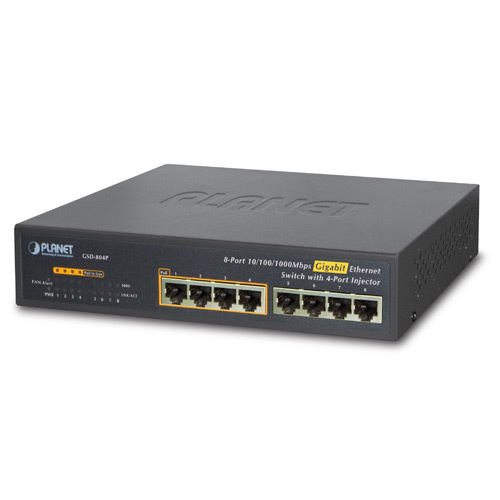 To fulfill the demand of sufficient PoE power for network applications with Gigabit speed transmission, PLANET has come out with a new member in the 802.3af PoE Gigabit Ethernet Switch family — GSD-804P, the 8-Port 10/100/1000Mbps with 4-Port 802.3af Power over Ethernet Switch which features high performance Gigabit IEEE 802.3af PoE (Up to 15.4 watts) and totally 55-watt PoE budget on half of the 10/100/1000Mbps TP ports of GSD-804P. The four 802.3af PoE ports provide PoE power injector function which is able to drive 4 IEEE 802.3af compliant powered devices. The GSD-804P also provides a simple, cost-effective and non-blocking wire-speed performance with 10-inch metal shape for desktop deployment in compact housing, SOHO office or department network application. Providing data transfer and PoE, the GSD-804P can reduce the need of extension cables and electrical outlets on the wall, ceiling or any unreachable place. It helps to lower the installation costs and simplify the installation effort. Besides, the key feature is energy saving. With more efficient switching power supply, the efficiency of the GSD-804P would be much better than four linear power adapters in the long run. Furthermore, it is the ideal device for bridging among Fast Ethernet and Gigabit Ethernet workgroups and networks. With Gigabit throughput and four 802.3af PoE interfaces supported, the GSD-804P is ideal for small business and workgroups to efficiently deploy the PoE network for the wireless access points, IP-based surveillance camera or IP phones in any places. The GSD-804P features high performance switch architecture capable of providing the non-blocking 16Gbps switch fabric and wire-speed throughput as high as 11.9Mpps, which greatly simplifies the tasks of upgrading the LAN for catering to increasing bandwidth demands. Besides, the 802.3x Full-Duplex flow control function of the GSD-804P enables PD devices and servers directly connect to the Switch for wire-speed packet transfer performance without risk of packet loss. The Idle mode Link Down power saving of the GSD-804P complies with IEEE 802.3az Energy Efficient Ethernet (EEE) standard to automatically lower power for a given port when it is not linked. The Intelligent Scales Power technology actively determines the appropriate power level based on the cable length. When connecting to the GSD-804P with Ethernet cable shorter than 20m, a device can obtain maximum power saving because the GSD-804P would automatically detect the Ethernet cable length and reduce power usage. The connected device can substantially reduce overall power consumption, which makes a significant contribution to energy saving. All RJ-45 copper interfaces in the GSD-804P support 10/100/1000Mbps Auto-Negotiation for optimal speed detection through RJ-45 Category 6, 5 or 5e cables. It also supports standard Auto-MDI/MDI-X that can detect the type of connection to any Ethernet device without requiring special straight or crossover cables. Providing 4-Port PoE in-line power interface, the GSD-804P can easily build a power centrally-controlled IP phone system, IP camera system and wireless AP group for the enterprise. For instance, up to 4 cameras can be installed around the corner in the company for surveillance demands or up to 4 wireless APs to build a wireless roaming environment in the office. Without the power-socket limitation, the Switch makes the installation of cameras or wireless AP easier and more efficiently.